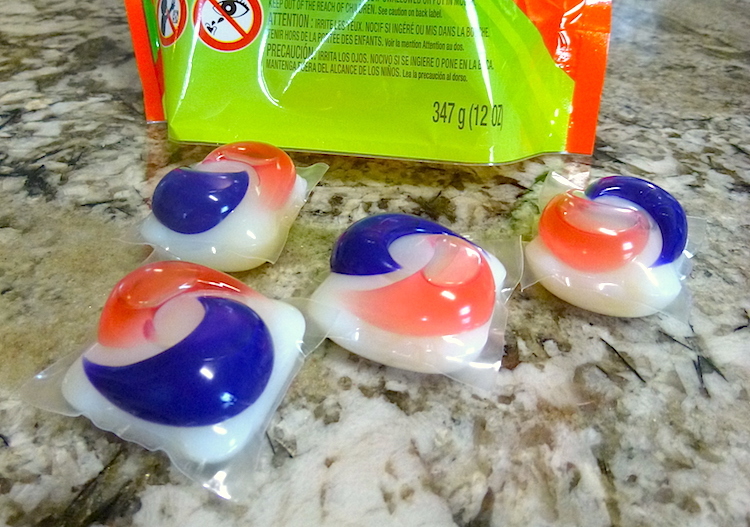 One bite of these concentrated packets of laundry detergent can cause serious, potentially life-threatening injury. Take that out of your mouth right now! 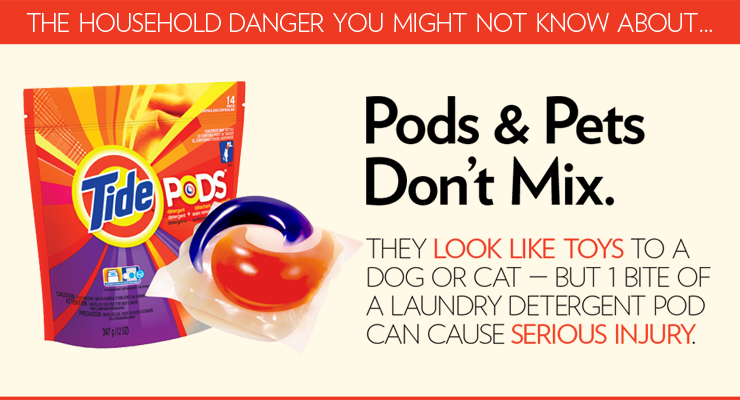 Well, if your child or your pet has a laundry detergent pod in his mouth, the damage may already be done. In 2013, toxicity from ingesting these these small, single-use concentrated laundry packets was high on the list of the ASPCA’s top 10 toxin list. Cats and small dogs seem to be most vulnerable. The problem in children younger than 5 is also on the rise as the new pods continue to gain in popularity. For pets, the pods look like brightly colored “toys” to bat around the house, hold between paws, and then, of course, bite down on. For young children, the appeal is even more dangerous. The pods look like candy to a toddler. Keep laundry detergent pods away from pets and children. They are dangerous. The laundry pods are designed to release the detergent when the outer membrane comes in contact with moisture. This moisture should be the water in your washing machine, not your pet’s or your child’s saliva. Serious gastrointestinal signs can occur, but it is damage to the respiratory tract that can be potentially life-threatening. If splashed in eyes, the detergent can cause serious eye damage and pain. I frequently get calls about cats jumping in tubs and licking a cleaning solution, or a pet licking household detergents or cleaners of various kinds. Although some of these can cause severe irritation, the majority of these exposures are self-limiting. Most pets lick a tiny amount of detergent from a surface or clean a paw that has walked through soap suds and stop. Why? Because the detergent tastes yucky, so the animal usually stops the ingestion. The amount ingested is also minimal and at a normal concentration. The pods create an entirely different problem. Just 1 “bite” and the detergent can fill a pet’s oral cavity, be immediately swallowed or be inhaled into the respiratory tract — causing aspiration pneumonia and serious lung damage. This is very serious, particularly for cats and small dogs with limited lung capacity. These pets can go into respiratory distress. The industry is under fire to change the packaging, making the pods harder to open and less visually appealing. The pods are also sold in plastic bags, not always difficult-to-open plastic tubs with locks. The plastic bags are easier for a pet to tear into. Many of these ingestions, however, have occurred because people leave their dirty laundry out in an open room with a pod sitting on top of the load, waiting for some little hand or little paw to come along investigating. The industry is aware of the dangers inherent in the packaging but has not made the pods much safer or less caustic. It also hasn’t stopped dressing them up like candy, which means attractiveness and marketing seem to trump child safety in the eyes of companies such as Procter & Gamble and The Sun Products Corporation, makers of Tide Pods and All Mighty Pacs, respectively, to name just 2 examples. Because of the many intensive care hospitalizations of both children and pets, and, unfortunately, isolated deaths, the industry has made small steps toward making the pods harder to break into. This has not been very successful. An online petition aims to put pressure on Procter & Gamble to further refine its Tide Pods packaging. If you see your pet munching on a laundry detergent pod, you know what to do: Remove it immediately and call your veterinarian. With any luck, the damage will be reversible. But what about the pet who gets into the pod or something toxic without you knowing? I am often presented with a pet who has strange signs and symptoms and no history. The detective work begins. Symptoms of toxin ingestion can mimic many other things. 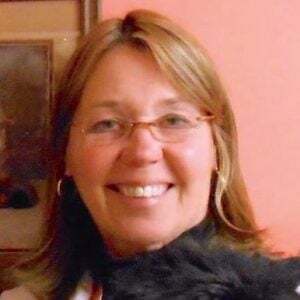 But without knowing that your cat got into a laundry detergent pod, your vet is challenged to both treat and support the kitty through the gastrointestinal or breathing difficulties, while also trying to find the cause. This is where your pet’s treatment could become more expensive. Tests would be done looking for why your cat can’t breathe. Your inquisitive, laundry-room-skulking kitty does not come into my clinic telling me he was trying to help you with your laundry. He may be in serious respiratory distress. Not being aware of a laundry detergent pod ingestion makes the case more complicated, more challenging and more costly. With new advances in household products and sweet-tasting medications come serious risks to our pets and children. Liquid potpourri, sugarless gum, laundry detergent pods, certain prescription medications, to name a few, do not scream at you with warnings of the dangers they pose. I must admit I was attracted to the cute little packets with their small size and eye-catching design. And where was I keeping my little attractive squishy swirls of blue and orange? Unlike dish detergents and many other household cleaners, my pods were not under my sink. They were out in clear reach of a paw, sitting on an open shelf near my washing machine. Not anymore.